What’s the happiest memory you have of your child’s development? I wouldn’t be surprised if it when you heard their first word. It’s a key milestone. From that point on, your child will absorb language faster and faster until eventually you can communicate easily with them. It’s also an emotional event. Their first word is usually ‘mama’ or ‘dada’ – a wonderful sign that they know who you are. It’s not just a sign of their burgeoning language skills, but also their emotional awareness. This is just one example of your child’s language skills helping them grow in other ways. And this interconnectedness makes language a crucial element of your child’s development. Why? Let’s explore the key areas of your child’s development and how language can help. Then, we’ll think about how you can help your child flourish. This is your child’s ability to learn and solve problems. Of course, one of the key ways they’ll learn is by talking to you, their parents. So encourage your child to reason out the answers to some of their questions themselves, before telling them. Not only will it help fire up their creativity, it will also boost their analytical skills. As your child grows, they’ll learn how to interact with others better and exercise self-control. Although non-verbal communication is important, you’ll really get to know your child’s personality when they start speaking. They’ll be able to make friends, talk to family members and learn how to follow social cues. As their ability to communicate deepens, so will the complexity of their relationships. This includes learning how to stand, jump and sit, as well as use small muscles like fingers to draw or pick things up. Even here, language can help. After all, learning to write is a physical activity that requires hand-eye coordination. So try teaching your toddler to recognise and copy the different letters of the alphabet. Show them which direction writing travels on the page and encourage them to try it themselves – even if their writing is just scribbling for now. By giving them the tools to start early, you’ll be helping them to sharpen their muscle control. Your child will get better at using their senses to observe the world around them as they grow. 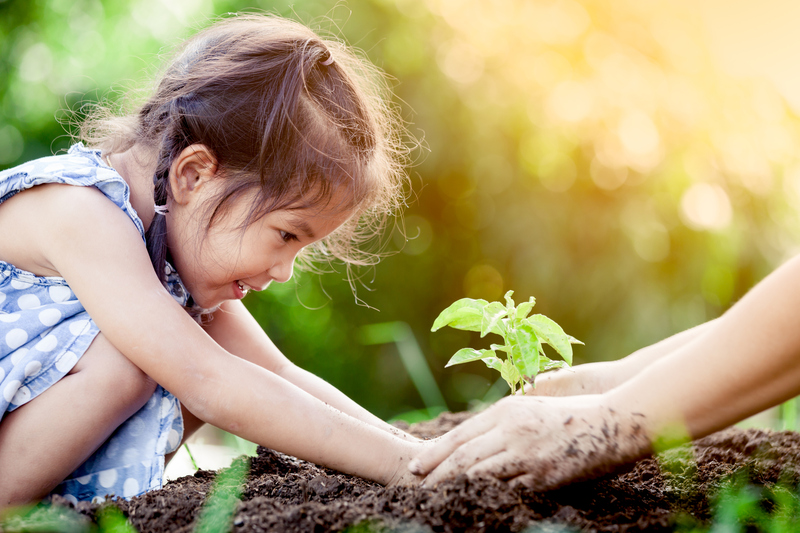 Running around and prodding things in the garden isn’t just fun – it’s a way for your child to discover the world! Your child will love being able to talk to you about these discoveries. So encourage them to describe what the snail felt like, or how cold the water was. It will help them to reflect on what they’ve seen and put words to their experiences. ‘Language’ is just the ability to communicate effectively – whether by speaking, writing or using non-verbal cues. We’ve already seen how connected it is to the other areas of your child’s development. So it’s no surprise that when children find it difficult to learn how to communicate, it can often be a sign of a deeper issue, such as learning or behavioural difficulties. That’s why it can be helpful to keep an eye out for some key language milestones. Children are constantly learning new things, but between the ages of two and six, their knowledge of language will develop in leaps and bounds. You can read about why – and which moments to watch out for – here [link to blog], remember that every child is unique. They’ll progress at their own pace, so don’t worry too much if your child is taking slightly longer than expected. So if language is that important, how can you help your child? Rhyming games and word play are another great way of helping your child to establish connections between words. They’ll have fun listening to nursery rhymes and songs while also learning new words, expressions and sentence combinations. The good news is that you don’t have to do everything yourself. There are loads of great resources on the internet, from educational games to age-appropriate stories and TV programmes. Don’t feel bad about using technology either – we asked an expert, and using screen time sensibly can be a great way of helping your child to learn. If you’re looking for inspiration, why not try our Club Lingumi app? It’s filled with fun, educational games designed specifically for your 2–6-year-old. Plus, lessons are limited to 15 minutes per day, so you don’t have to worry about your child spending too much time online. Let Lingumi help with your child’s development – you’ll be amazed at the difference it can make.